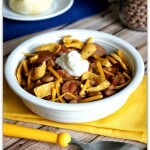 Slow Cooker Chili With Pinto Beans and Sausage–make homemade chili with dried beans at home in your slow cooker. 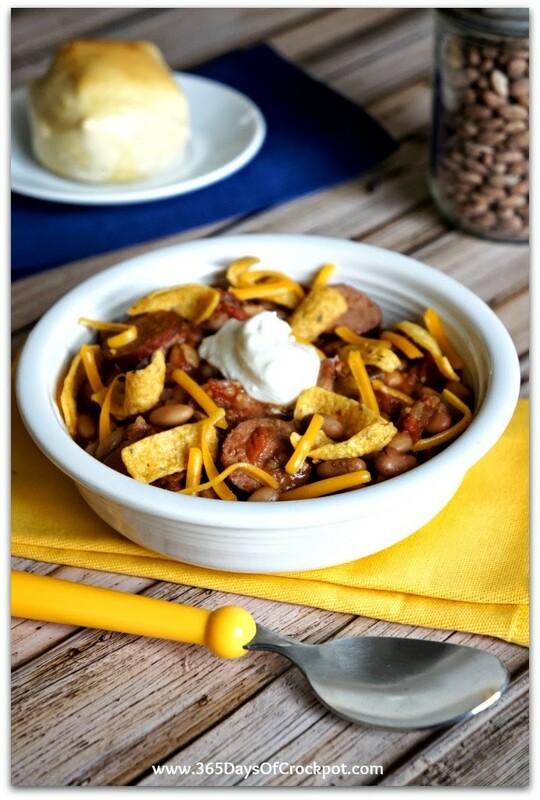 Sliced smoked sausage gives this chili a boost of flavor and no browning is required! Make homemade chili with dried beans at home in your slow cooker. Sliced smoked sausage gives this chili a boost of flavor and no browning is required! The night before you want the chili, soak the beans in plenty of water overnight with the tsp of salt. The next morning, drain the water and rinse off the beans. Cover and cook on LOW for 8-10 hours, until beans are soft and flavors blended. Add in brown sugar, tomatoes and tomato paste. Add salt and pepper to taste and more spices, if needed. And if you’re in love with soups this winter like I am, it’s actually National Soup Day today! I’m going to celebrate by posting 23 soup recipes that will warm you up in no time. This is delicious and very different from any chili I have made before. To be honest, I should say that I made some changes–omitted the tomato paste and only used 1 tsp. of brown sugar. My husband and I both loved it, and it is one of the easier crockpot chilis I’ve made. Thank you! I am always looking for ways to use up my dried beans. This soup looks fantastic, and with the sausage, I know my whole family would love it! Always up for some chili, yum! I love that there are so many different ways to make chili – this one looks fantastic! YUM! I have got to convert more of my recipes into slow cooker versions – how delicious does this chili sound!!! This sounds like a fantastic and budget friendly chili! My mom always made chili with dry beans! This looks pretty close to her recipe, I can’t wait to try it! This looks delicious! I love cooking with dried beans because they’re so economical. This looks like the perfect way to use them! No need to brown the meat first! if you don't have a microwave, would you recommend cooking step 2 ingredients on the stove, or just skipping step two and putting it all in the slow cooker? If you have time, I would saute on the stove! If it's too salty it's probably because you used salted canned beans, salted canned tomatoes, and salty sausage. If all three of these are salted you might not need additional salt! jzf, thanks for the comment! I guess the best advice is to salt and pepper to taste. 2 tsp is TOO MUCH SALT!!! Almost ruined it. Use half as much, and add more if needed. My package of celery said stalks, is there really any difference? I have this recipe started in the crock right now – used 1/2 hamburger and 1/2 sausage pieces – doubled the recipe since I have 4 teens. Will let you know what I think, but so far, it smells wonderful! I have a 15 month old am in the process of opening a gelato shop in my hometown and I have NO time. I think it's so important to eat "real food" even if your busy. I'm making this for dinner tomorrow night. I made a few substitutions based on what i had in my pantry. I used chopped sundried tomatoes instead of tomato paste and oil, used chopped fresh roma tomatoes instead of canned tomatoes and browned ground turkey with the onions and celery. I mixed it all up (minus the beans) and put it in the fridge to set in the slow cooker in the morning. I look forward to trying more of your recipes this year. Thank you! If you will add a teaspoon ground ginger, you will not have the gas. Learned this from an Indian friend. It works for any dried beans, etc. What if I don't soak the dried beans first?